(CNN) -- A prominent Somali journalist was shot and killed by suspected Islamist gunmen in broad daylight on Wednesday, as one of his colleagues watched in horror. Journalist Said Tahlil Ahmed was killed by gunmen in Somalia, according to a colleague who was with him. The journalist who witnessed the assassination of Said Tahlil Ahmed in Mogadishu said the two gunmen also intended to kill others. "First, they shot him in the back and then one of the armed men came over him and fired more shots into his head to finish him off," he said. "One of the gunmen was shouting, 'Kill the other one,' which they meant another one of us." The journalist did not want his name released for security reasons. Tahlil, the director of independent HornAfrik Radio and host of a popular radio talk show, was on his way to a meeting that had been called by the Islamist militia Al-Shabaab, when gunmen from the group attacked him, his colleague said. The National Union of Somali Journalists issued a statement strongly condemning Tahlil's assassination, which it blamed on Al-Shabaab -- a radical Islamist militia that controls parts of Mogadishu and four regions in southern Somalia. 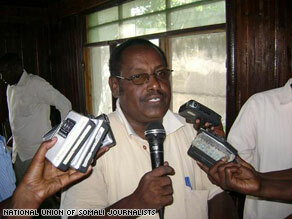 "This is an outrageous and appalling assassination," said NUSOJ Secretary-General Omar Faruk Osman, in a prepared statement. "Said Tahlil Ahmed was assassinated because of his strong and professional commitment for independent journalism." The surviving journalist -- who suffered injuries to his legs after he fell down while fleeing the attack -- said Al-Shabaab had called for a meeting with Mogadishu radio station directors, but the group would not say what the meeting was about, according to the witness and NUSOJ. "This is absolutely shocking and the journalists in Mogadishu are in a state of fear," the journalist said. "We are extremely worried about our safety." Local radio and television stations in the Somali capital had been broadcasting live coverage of last week's Somali presidential election held in Djibouti, which many Islamist groups -- including Al-Shabaab -- have rejected. Al-Shabaab has imposed harsh Islamic law, or sharia, in the areas of Somalia that it controls. It seized the city of Baidoa, where the transitional government is based, preventing the newly elected government from returning to Somalia. Last year, the United States put Al-Shabaab on its list of terrorist organizations because of its ties to al Qaeda. Tahlil is the second journalist to be murdered in Somalia this year. Militias shot and killed Hassan Mayow Hassan, a reporter for Shabelle Radio, on January 1 in the agricultural town of Afgoye. The Committee to Protect Journalists lists Somalia as the seventh most deadly nation in the world for journalists. Members of the news media work under duress there amid a war between a weak transitional government and insurgents, the committee said, and 10 Somali journalists have been killed in the last two years. Tahlil's predecessor, HornAfrik chairman Ali Iman Sharke, was killed by a roadside bomb in Mogadishu in 2007, after he had returned from the funeral of another radio director who was killed on the same day by unknown gunmen in Mogadishu. Shabelle radio's acting director, Bashir Nor Gedi, was also killed in 2007 near his home in Mogadishu by unknown gunmen.